Coláiste Naomh Eoin ethos is to inspire a love of the Irish language & culture in our students by making learning Irish fun. We make every effort to ensure that all our students learn Irish in a relaxed & enjoyable atmosphere so they develop a positive attitude towards the Irish language & culture. We make every effort to introduce variety and strive to offer a wide range of activities to help develop a new positive perspective of the Irish language within our students. 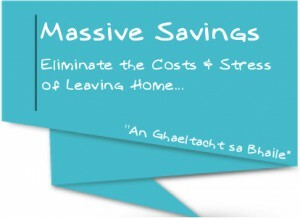 Develop a new appreciation of the Irish language & culture within all our students. Help students with their personal development in a positive and enjoyable manner through the medium of Irish. Create a safe, relaxed, enjoyable and educational atmosphere. Organise fun and an interactive course program to be taught in an enjoyable & comprehensive manner. Achieve the highest possible standards in every aspect of the Coláiste. Put the needs of our customers as our primary concern. Remain as Ireland’s #1 Gaeltacht. Always give value for money. Create a rewarding learning environment for our students in order to help cultivate positive relationships.